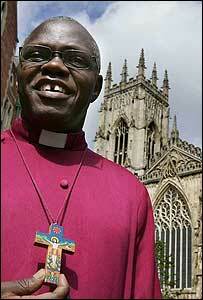 So John Sentamu has become Britains first black archbishop. Good news all round for the Anglican church. John was the Bishop of Stepney, and therefor our local bishop at St Luke’s for quite a few years before he moved up to become Bishop of Birmingham in 2002, so I met him a few times and always liked him. He had a habit of taking the piss out of the St Luke’s congregation which was rather endearing in a Bishop. He seems to be very focussed on justice issues, having spoken out again Idi Amin in Uganda in the 70s, and was involved in the Damilola Taylor and Stephen Lawrence inquiries. And it’s nice to see the white hegemony of the upper echelons of the Anglican church break down a little. Now we just need a woman or 12 in there as well.